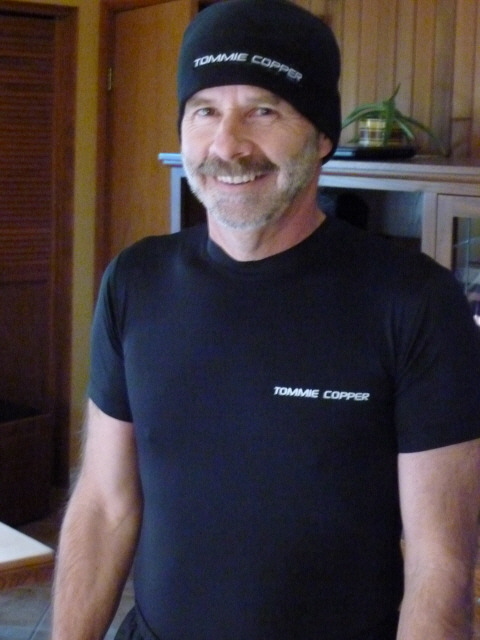 Several weeks ago The Captain received a nice package from Jordan at Tommie Copper... he opened it and found one of their men's compresion shirts inside. I had been wanting him to try one after my own love affair with a compression shirt began post eye surgery in October, where I had to sit or lie face-down for 4 days afterward... You can read that account here if you like. The Captain loves /likes to will run with me, but our winters here are often wet and cool and very dreary. His biggest complaint when we run on cool days is that his back gets cold... then he tenses up his muscles and they get stiff and sore. I thought that a Tommie Copper compression shirt, with its patented copper-infused yarn might help his back muscles recover more quickly.... but what we soon discovered was that if he wears his compression shirt while he is running, that it keeps his back warm and he doesn't need any recovery. Instead of wearing a tee made of a technical moisture-wicking fabric, on cooler days The Captain wears his Tommie Copper compression shirt under a long-sleeved tee and a light jacket... the copper-insfused fabric keeps his back warm and he is a happier runner. It is so soft and so light that it is a pleasure to wear and it looks darn good too! He also really loves the knit cap that Jordan sent to me earlier, too. It is made from the same light and soft copper-infused fabric as the shirts. This cap sheds raindrops and is just right for our cool winter outdoor runs and and walks. Happy Captain sporting grizzly winter beard! In Canada we call this style of hat a 'toque' (sounds like kook)! Tommie Coppe is the leader in innovative copper compression wear designed to be comfortably worn all day and all night by anyone looking for relief from everyday aches and pains, chronic pain, or relief from sports injuries. We both love our copper-infused compression garments... within minutes of putting them on there is a noticeable change in blood flow which makes us feel warmer and more at ease. Thanks again to Jordan for working with us and for supporting The Captain's efforts as we train for our first half marathon race over the next several weeks. Please visit the Tommie Copper web site for more information at www.tommiecopper.com. The garments were supplied by Tommie Copper at no cost to us, and the opinions expressed are 100%our own. Heard so much about Tommie, but never tried it. It looks great on Captain! Here's hoping those wet/dreary runs don't last much longer! I've heard such great things about Tommie Copper stuff!! And one time I won a giveaway (the weekend of the Rehoboth Marathon) and since I replied after three days --the cutoff apparently was two days :(... I ended up not being able to get them. yayyyyy!!!! the Captain needs to make more picture appearances on your blog! so fun! glad he loves TC as much as we all do :) happy Monday Elle! The Captain is a very handsome gentleman - especially in his Tommie Cooper gear! So happy to finally see a picture of him. You too are perfect for one another. Plus, he just LOOKS like the Captain of a ship, which is just plain cool. I'm honestly not sure what we did before Tommie Copper. I swear I think Allan wears his calf sleeves or beanie nearly every day! Glad the Captain is enjoying his TC gear!